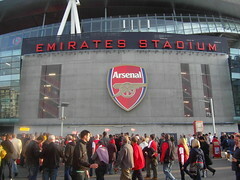 Paul and I had high hopes but low expectations as we made our way to the Emirates last night. 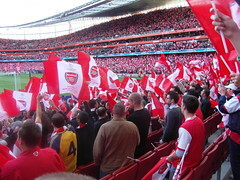 Every seat had a flag on it that we waved madly. Sadly eleven minutes later it was all over. 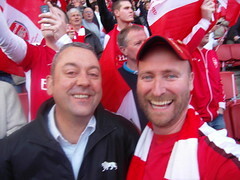 Still, we enjoyed it - even in defeat. 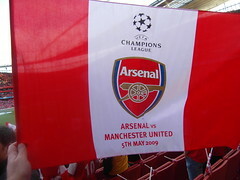 You learn to do that supporting Arsenal. I took some snaps too. Argh, I am not yet used to the hurt. Kept hoping for a miracle. Yes, from Arsenal. And every time that asparagus Ronaldo scored I asked myself if there's any justice in the world. We were so full of enthusiasm at the start... sadly every time they scored we took it like a smack in the kisser. By half time we were stunned. In fact we even started to enjoy it in the second half when we knew we couldn't win. We became almost euphoric. Weird how football affects you!